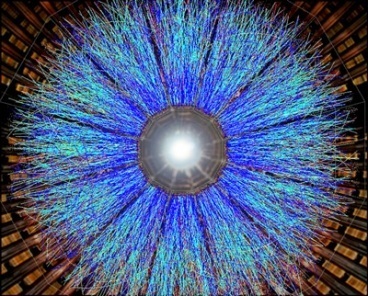 Tags: An experiment at the European Center for Nuclear Research (CERN) revealed that the sum of quark and antiquark spins within a proton could account for at best a quarter of the overall spin., Antiquarks have only a fleeting existence. They form as quark-antiquark pairs when gluons split., “We call these pairs the quark sea” Drachenberg said. 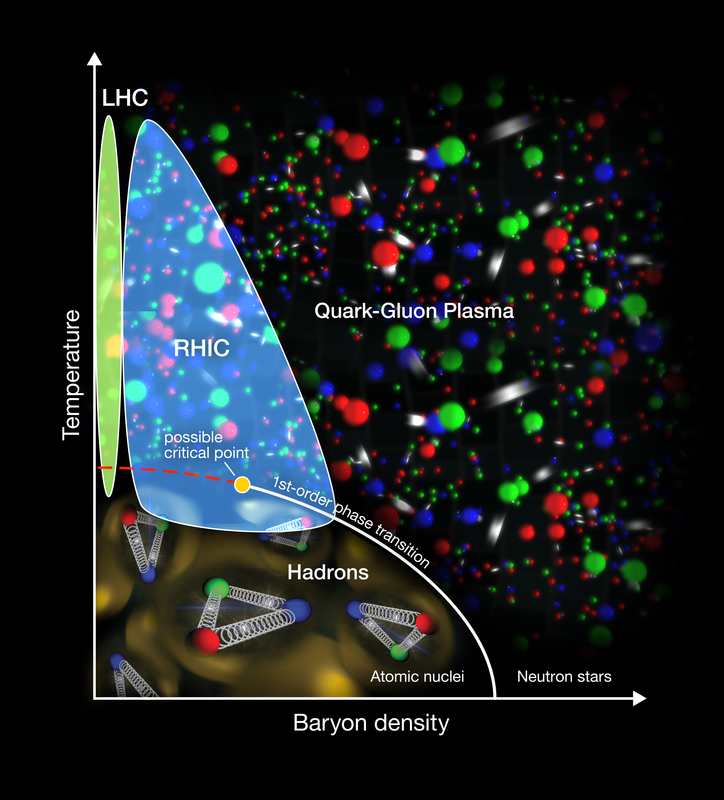 “At any given instant you have quarks gluons and a sea of quark-antiquark pairs that contribute in some way to the description of the proton, Basic Research ( 10,460 ), BNL RHIC, BNL STAR ( 4 ), Particle Physics ( 1,475 ), Physics ( 1,431 ), The latest data from RHIC reveal that the antiquarks' contribution is more complex than previously thought., The latest data include signals captured by STAR’s new endcap calorimeter, The proton spin puzzle, There was a full-blown spin “crisis” in the 1980s. New data from the STAR experiment at the Relativistic Heavy Ion Collider (RHIC) add detail—and complexity—to an intriguing puzzle that scientists have been seeking to solve: how the building blocks that make up a proton contribute to its spin. 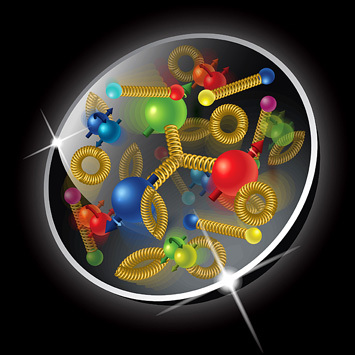 The results, just published as a rapid communication in the journal Physical Review D, reveal definitively for the first time that different “flavors” of antiquarks contribute differently to the proton’s overall spin—and in a way that’s opposite to those flavors’ relative abundance. Quarks come in six flavors—the up and down varieties that make up the protons and neutrons of ordinary visible matter, and four other more exotic species. Splitting gluons can produce up quark/antiquark pairs, down quark/antiquark pairs—and sometimes even more exotic quark/antiquark pairs. “Because there is this surprise—an asymmetry in the abundance of these two flavors—we thought there might also be a surprise in their role in spin,” Drachenberg said. Indeed, earlier results from RHIC indicated there might be a difference in how the two flavors contribute to spin, encouraging the STAR team to do more experiments. For all of these experiments, STAR analyzed the results of polarized proton collisions at RHIC—collisions where the overall spin direction of RHIC’s two beams of protons was aligned in particular ways. Looking for differences in the number of certain particles produced when the spin direction of one polarized proton beam is flipped can be used to track the spin alignment of various constituents—and therefore their contributions to overall proton spin. 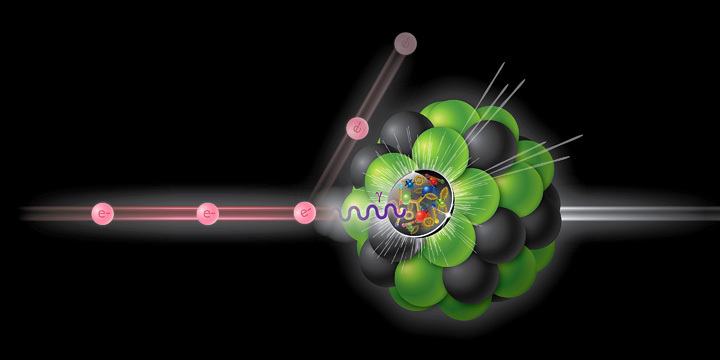 For the sea quark measurements, STAR physicists counted electrons and positrons—antimatter versions of electrons that are the same in every way except that they carry a positive rather than a negative electric charge. The electrons and positrons come from the decay of particles called W bosons, which also come in negative and positive varieties, depending on whether they contain an up or down antiquark. 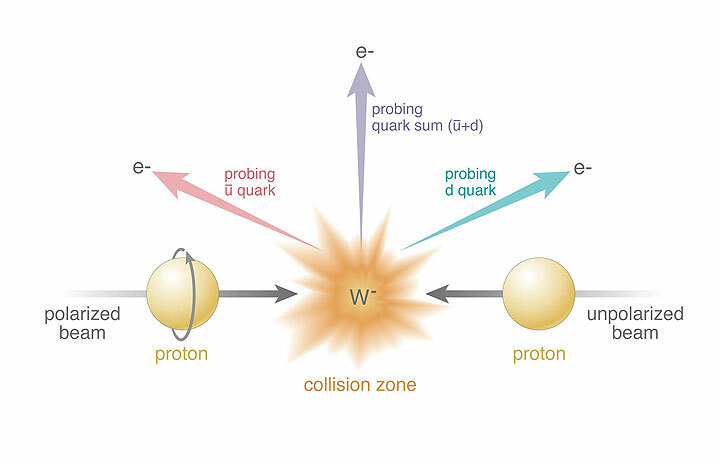 The difference in the number of electrons produced when the colliding proton’s spin direction is flipped indicates a difference in W- production and serves as a stand in for measuring the spin alignment of the up antiquarks. Similarly, the difference in positrons comes from a difference in W+ production and serves the stand-in role for measuring the spin contribution of down antiquarks. Collisions of polarized protons (beam entering from left) and unpolarized protons (right) result in the production of W bosons (in this case, W-). RHIC’s detectors identify the particles emitted as the W bosons decay (in this case, electrons, e-) and the angles at which they emerge. 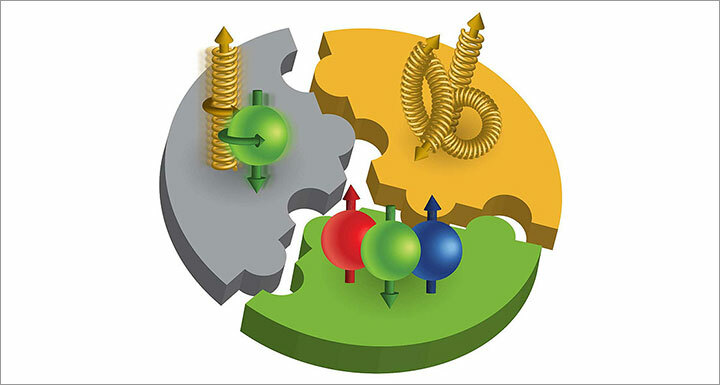 The colored arrows represent different possible directions, which probe how different quark flavors—e.g., an “up” antiquark (u) and a “down” quark (d)—contribute to the proton spin. Additional STAR measurements might offer insight into the spin contributions of exotic quark/antiquark pairs. In addition, U.S. scientists hope to delve deeper into the spin mystery at a proposed future Electron-Ion Collider. This particle accelerator would use electrons to directly probe the spin structure of the internal components of a proton—and should ultimately solve the proton spin puzzle. Research at RHIC is funded primarily by the DOE Office of Science (NP). The STAR endcap calorimeter used for the forward and rearward measurements included in this analysis was funded in large part by the National Science Foundation. It was built at Indiana University under the leadership of STAR collaborator Will Jacobs. Graduate students Jinlong Zhang of Shandong University (subsequently a postdoctoral fellow at LBNL and now at Stony Brook University), Devika Gunarathne of Temple University, and Amani Kraishan of Temple University (now at Al-Hussein Bin Talal University in Jordan) analyzed the data resulting in this publication. Elke-Caroline Aschenauer, widely recognized for helping to design and lead experiments in nuclear physics, at the STAR detector of the Relativistic Heavy Ion Collider (RHIC), a particle collider that explores the particles and forces that form the bulk of visible matter in the universe. 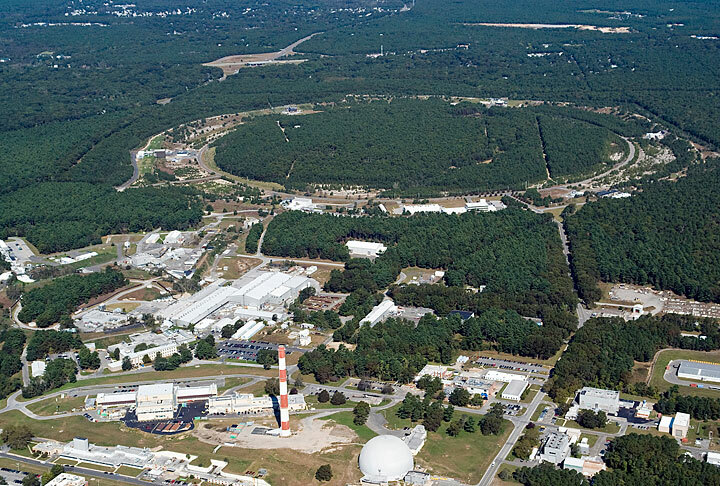 Elke-Caroline Aschenauer, a senior physicist at the U.S. Department of Energy’s Brookhaven National Laboratory, has been awarded a Humboldt Research Award for her contributions to the field of experimental nuclear physics. This prestigious international award—issued by the Alexander von Humboldt Foundation in Bonn, Germany—comes with a prize of €60,000 (more than $70,000 U.S.) and the opportunity to spend up to one year in Germany (not necessarily continuously) to collaborate with researchers at universities and research organizations there. These relationships, she said, will help to foster or strengthen collaborations among European and U.S. physicists addressing some of the major research aims at Brookhaven Lab’s Relativistic Heavy Ion Collider (RHIC)—a DOE Office of Science user facility for nuclear physics research—as well as among those hoping to build a U.S.-based Electron-Ion Collider (EIC), a proposed facility for which Aschenauer has been a strong proponent. “This opportunity will in many ways help us to be in contact with many experts in the field in Germany and the rest of Europe, and it will help promote the EIC and the Cold QCD Physics program at RHIC,” she said. QCD, or Quantum Chromodynamics, is the theory that describes how the strong nuclear force binds the fundamental building blocks of visible matter—the stuff that makes up everything we see in the universe, from stars, to planets, to people. 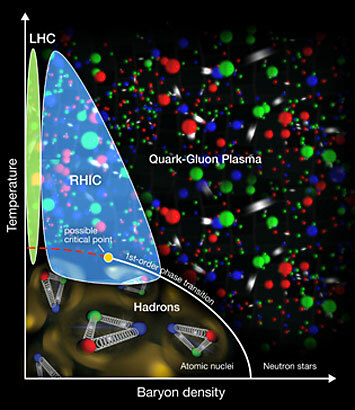 RHIC explores QCD by colliding protons, heavy ions, and protons with heavy ions, sometimes recreating the extreme heat and pressure that existed in the early universe, and sometimes using one particle to probe the structure of another nucleus without heating it up (that is, in its “cold” initial state). By giving scientists a deeper understanding of QCD and the strong nuclear force, these experiments will help elucidate how matter is constructed from the smallest scales imaginable to the large-scale structure of the universe today. Aschenauer is widely recognized for helping to design and lead various experiments that have explored these fundamental questions, particularly the internal structure of the protons and neutrons that make up atomic nuclei. At Germany’s Deutsches Elektronen-Synchrotron (DESY) laboratory, she was involved in the HERMES experiment taking snapshots of the inside of protons. 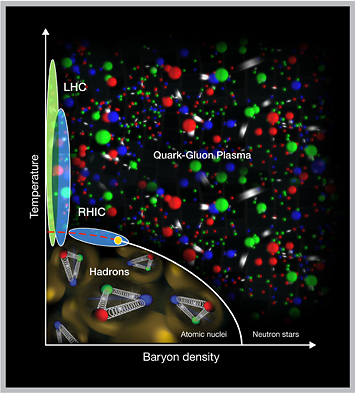 This experiment revealed the first information about the three-dimensional distribution of smaller building blocks called “quarks,” which are held together inside protons by glue-like “gluons,” carriers of the strong nuclear force. She also helped devise ways to measure how these smaller building blocks contribute to the overall “spin” of protons. 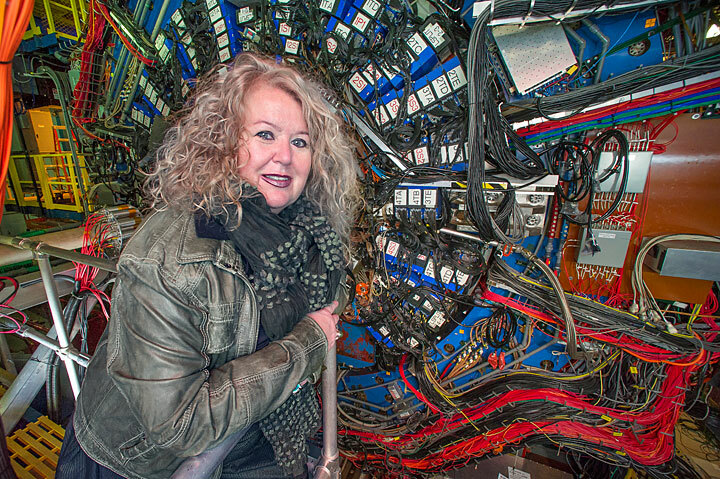 She continued her explorations of nuclear structure at Thomas Jefferson National Accelerator Facility (Jefferson Lab), leading a new experiment for studying gluon structure through the design and approval stages. Since 2009, she has been the leader of the medium-energy physics group at Brookhaven National Laboratory, designing detector components and new measurement techniques for experiments at RHIC. In addition to using particle collisions to recreate the conditions of the early universe, RHIC is also the world’s only polarized proton collider for spin physics studies. Spin, or more precisely, intrinsic angular momentum, is a fundamental property of subatomic particles that is somewhat analogous to the spinning of a toy top with a particular orientation. A particle’s spin influences its optical, electrical, and magnetic characteristics; it is essential to technologies such as magnetic resonance imaging (MRI), for example. Yet the origin of spin in a composite particle such as the proton is still not well understood. Experiments in the 1980s revealed that the spins of a proton’s three main constituent quarks account for only about a third of the overall proton spin, setting off a “crisis” among physicists and a worldwide quest to measure other sources of proton spin. Aschenauer has been at the forefront of this effort, bringing both an understanding of the underlying theory and designing and performing cutting-edge experiments to explore spin, both in Germany and the U.S. At RHIC, these experiments have revealed an important role for gluons, possibly equal to or more significant than that of the quarks, in establishing proton spin. As an advocate for a future Electron-Ion Collider, Aschenauer has been instrumental in establishing how this machine could be used to make additional measurements to resolve the inner structure of protons, and is helping to translate those ideas into designs for the detector and interaction region that will achieve this goal at an EIC. 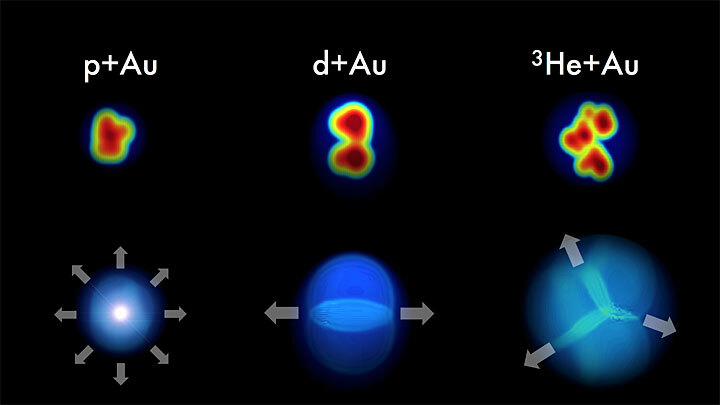 Aschenauer together with members of her group also developed an innovative way to use spin as a tool for probing the “color” interactions among quarks in a way that tests a theoretical concept of nature’s strongest force and paves a way toward mapping protons’ 3D internal structure. This work established the science case for the key measurements taken during the polarized proton run at RHIC in 2017, and also lays the foundation for future experiments at a proposed EIC. As noted by Andreas Schäfer of Germany’s University of Regensburg, who nominated Aschenauer for this honor and will serve as her German host, both the “hot” and “cold” QCD communities of physicists support the EIC thanks in large part to the efforts of Aschenauer and her colleagues to showcase the science that could be achieved at such a machine. He noted that the EIC could also have relevance to the physics program at Europe’s Large Hadron Collider (LHC) and possible future European colliders. “All European Electron-Ion Collider User Group members would profit from Aschenauer being in Germany for a longer stretch of time,” Schäfer said. “While Regensburg would be the host university, Aschenauer would spend much of her time meeting with other European groups of experimentalists as well as theoreticians,” he added. Aschenauer really enjoys this interplay of experiment and theory and turning ideas into experimental reality. “I like the combination between coming up with an idea—how to measure something—and helping to build a detector or system to make that measurement. I find that a very interesting challenge. And then also, once you have done that, you get to analyze the data to get a result that pushes the field forward with new knowledge,” she said. Aschenauer earned a Ph.D. in physics from the Swiss Federal Institute of Technology (ETH) Zürich in 1994, then accepted a personal postdoctoral fellowship from the European Union to work at the Dutch National Institute for Subatomic Physics and the University of Ghent in Belgium. She joined DESY in Germany as a postdoc in 1997, beginning her research on proton spin at the HERMES experiment, and became a staff scientist there in 2001. After being part of a team that built the ring-imaging Cherenkov (RICH) detector for HERMES, she spent three years as Deputy Spokesperson and Run Coordinator, and then 3.5 years as the spokesperson of the HERMES experiment. In 2006, she moved to Jefferson Lab and was the group leader of the Hall D scientific and technical staff and project leader for the Hall D contribution to the 12 GeV Upgrade Project. She joined Brookhaven as a staff scientist in 2009, received tenure in 2010, and was named a Fellow of the American Physical Society in 2013. New approach to raw data reconstruction has potential to turn particle tracks into physics discoveries faster. Mark Lukascsyk, Jérôme Lauret, and Levente Hajdu standing beside a tape silo at the RHIC & ATLAS Computing Facility at Brookhaven National Laboratory. Data sets from RHIC runs are stored on tape and were transferred from Brookhaven to NERSC. For the first time, scientists have used high-performance computing (HPC) to reconstruct the data collected by a nuclear physics experiment—an advance that could dramatically reduce the time it takes to make detailed data available for scientific discoveries. The demonstration project used the Cori supercomputer at the National Energy Research Scientific Computing Center (NERSC), a high-performance computing center at Lawrence Berkeley National Laboratory in California, to reconstruct multiple datasets collected by the STAR detector during particle collisions at the Relativistic Heavy Ion Collider (RHIC), a nuclear physics research facility at Brookhaven National Laboratory in New York. “This is a key usage model of high-performance computing for experimental data, demonstrating that researchers can get their raw data processing or simulation campaigns done in a few days or weeks at a critical time instead of spreading out over months on their own dedicated resources,” said Jeff Porter, a member of the data and analytics services team at NERSC. 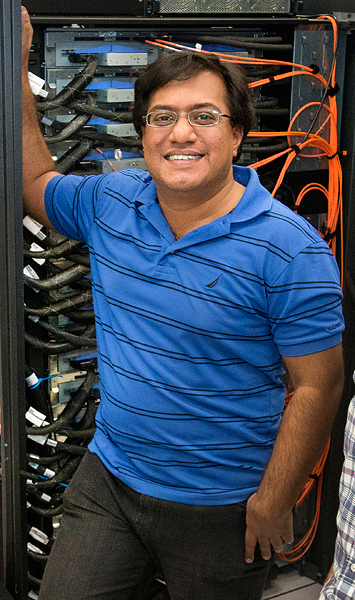 By running multiple computing jobs simultaneously on the allotted supercomputing cores, the team transformed 4.73 petabytes of raw data into 2.45 petabytes of “physics-ready” data in a fraction of the time it would have taken using in-house high-throughput computing resources, even with a two-way transcontinental data journey. “We wrote workflow programs that achieved the first level of parallelization—event parallelization,” Lauret said. That means they submit fewer jobs made of many events that can be processed simultaneously on the many HPC computing cores. “We had a lot of assistance from the networking professionals at Brookhaven,” said Lauret, “particularly Mark Lukascsyk, one of our network engineers, who was so excited about the science and helping us make discoveries.” Colleagues in the RACF and ESnet also helped identify hardware issues and developed solutions as the team worked closely with Jeff Porter, Mustafa Mustafa, and others at NERSC to optimize the data transfer and the end-to-end workflow. This animation shows a series of collision events at STAR, each with thousands of particle tracks and the signals registered as some of those particles strike various detector components. It should give you an idea of how complex the challenge is to reconstruct a complete record of every single particle and the conditions under which it was created so scientists can compare hundreds of millions of events to look for trends and make discoveries. “We’ve proven that we can use the HPC resources efficiently to eliminate backlogs of unprocessed data and resolve temporary resource demands to speed up science discoveries,” Lauret said. Total reflects 17 years of experimental physics data collected by scientists to understand the fundamental nature of matter and the basic forces that shape our universe. 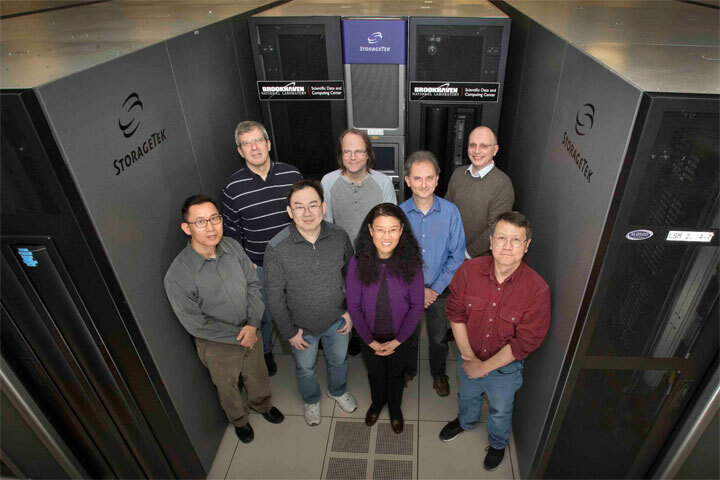 (Back row) Ognian Novakov, Christopher Pinkenburg, Jérôme Lauret, Eric Lançon, (front row) Tim Chou, David Yu, Guangwei Che, and Shigeki Misawa at Brookhaven Lab’s Scientific Data and Computing Center, which houses the Oracle StorageTek tape storage system where experimental data are recorded. SDCC is at the core of a global computing network connecting more than 2,500 researchers around the world with data from the STAR and PHENIX experiments at RHIC—a DOE Office of Science User Facility at Brookhaven—and the ATLAS experiment at the Large Hadron Collider (LHC) in Europe. In these particle collision experiments, scientists recreate conditions that existed just after the Big Bang, with the goal of understanding the fundamental forces of nature—gravitational, electromagnetic, strong nuclear, and weak nuclear—and the basic structure of matter, energy, space, and time. The RHIC and ATLAS experiments are part of the big data revolution. These experiments involve collecting extremely large datasets that reduce statistical uncertainty to make high-precision measurements and search for extremely rare processes and particles. For example, only one Higgs boson—an elementary particle whose energy field is thought to give mass to all the other elementary particles—is produced for every billion proton-proton collisions at the LHC. More, once produced, the Higgs boson almost immediately decays into other particles. So detecting the particle is a rare event, with around one trillion collisions required to detect a single instance. When scientists first discovered the Higgs boson at the LHC in 2012, they observed about 20 instances, recording and analyzing more than 300 trillion collisions to confirm the particle’s discovery.